I wonder how accurate this was at predicting the weather. I would think that a lot of things would create static that aren’t harbingers of storm clouds. 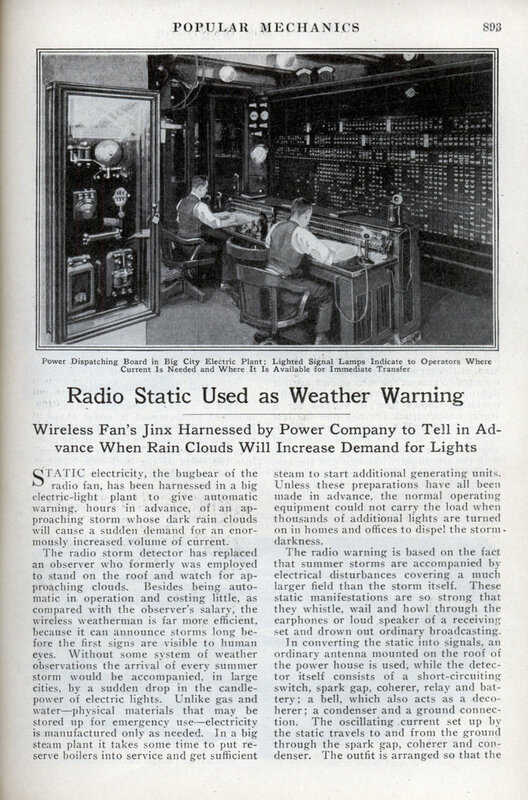 STATIC electricity, the bugbear of the radio fan, has been harnessed in a big electric-light plant to give automatic warning, hours in advance, of an approaching storm whose dark rain clouds will cause a sudden demand for an enormously increased volume of current. steam to start additional generating units. Unless these preparations have all been made in advance, the normal operating equipment could not carry the load when thousands of additional lights are turned on in homes and offices to dispel the storm darkness. The radio warning is based on the fact that summer storms are accompanied by electrical disturbances covering a much larger field than the storm itself. These static manifestations are so strong that they whistle, wail and howl through the earphones or loud speaker of a receiving set and drown out ordinary broadcasting. 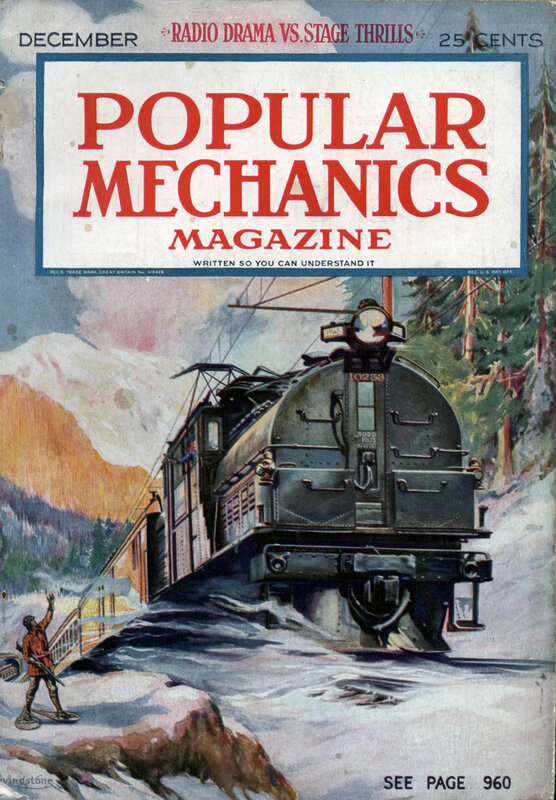 In converting the static into signals, an ordinary antenna mounted on the roof of the power house is used, while the detector itself consists of a short-circuiting switch, spark gap, coherer, relay and battery; a bell, which also acts as a deco-lierer; a condenser and a ground connection. The oscillating current set up by the static travels to and from the ground through the spark gap, coherer and condenser. The outfit is arranged so that the bell automatically varies its signal as the storm approaches. From two to five hours before it arrives, the hell rings at intervals of from five to fifteen minutes. The difference in the advance signal depends on whether the storm is following a straight or roundabout course. The operator in charge of the lighting system regards the ringing at intervals merely as an advance warning, and pays no further attention to it, for it is always possible that the storm may change its direction and pass around the city. As the clouds approach, however, the bell rings oftener, until, when the storm is less than two hours away, the bell begins striking every half minute. The reserve boilers are then ordered into service, auxiliaries of additional generating units are started, and the generators themselves begin turning over at low speed. A half hour before the storm is due, the bell unites its periodic strokes with a continuous ringing, though the sky may still remain clear as far as the eve can see. The operator, however, orders the reserve generators synchronized with the service bus wire and prepares to carry the storm load, at the same time short-circuiting the detector to protect the instruments against lightning. A chart record of the bell’s operation shows how it worked for a storm which struck the city one day last August. At 8:25 a. m. the signal began tolling every three to five minutes, and kept up that rate until 2:00 p.m. At 2:02, with the sky slightly overcast and the system load totaling 280,000 kilowatts, the bell changed to half-minute intervals, and continued that way until 2:15 p.m., when it began ringing uninterruptedly until it was short-circuited at 3:20 p.m. At 3:45 the storm broke, and the load jumped from 280.000 kilowatts to 420,000 kilowatts. The big generating plants supplying large cities carry an enormous lighting load, which varies by hundreds of thousands of kilowatts at different hours of the day and night. A single one, recently completed on the Mississippi, can light 9,500,000 average-size lights. Some idea of the magnitude of the load carried by one of these plants is gained when it is understood that this middle-western installation has three times the year-around power that the great Muscle Shoals water-power project will develop. It consumes a ton of coal every half minute, and uses 600.000,-000 gallons of water a day. To manufacture the enormous electrical current needed, the last bit of heat value must be extracted from the coal, and for this purpose the fuel is ground to a fine powder that looks and flows like fuel oil. In the furnace this dust acts like gasoline in a carburetor, giving up its heat so completely that instead of the usual cloud of smoke only a thin haze is seen above the tall stacks of the plant. It actually worked very well in predicting cumulonimbus activity. You can do the same thing today with a series of shortwave radios and antennas. Aviators need to know specifically where cumulonimbus activity exists so they can avoid these dangerous clouds. (Most rainclouds are not CBs and don’t cause much convective activity above a certain level, so they’re not nearly as hazardous.) CB clouds cause more static than almost anything else in existence, and certainly more than anything else that would have existed in 1924, so using static to predict where CB activity is could save lives. There have been “Stormscope” and “Strikefinder” devices available for aviation use for many years. They are lighter and consume less power than airborne weather radar, but still provide useful information. More recently, lightning strike information from RF sensors is combined with GPS navigation and radar data (from either airborne or ground-based radars via data link) on integrated flight data displays. I wonder how many false alarms were generated by solar flares? Not too many, I’d imagine. Solar activity influences terrestrial radio mainly by mucking about with the reflecting layers in the ionosphere. Significant “atmospherics” (which radio amateurs call “QRN”) are usually ground-wave phenomena. A couple of meteorologists have setup feedback listening devices measuring how much static cellphones get. It works to create an incredibly detailed map of rain fall levels since the rain plays havoc with signals.